Processes that are environmentally friendly, energy and resource renewable continue to attract promotion. 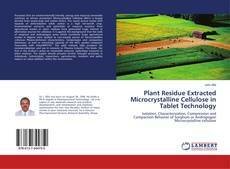 Microcrystalline Cellulose (MCC) is largely derived from wood pulp and cotton linters. The wood source comes with hazards of deforestation while cotton is a high net-worth crop. Environmental concerns and potentials of resource recovery from agricultural wastes or plant residues have generated huge interest in alternative sources for cellulose. It is against this background that the stalk of sorghum and andropogon grass which constitute huge agricultural wastes in Nigeria were studied as non-woody source of microcrystalline cellulose. Physico-technical characteristics, Compression and compaction behaviour, as well as reworking capacity of the MCC grades compared favourably with Avicel®PH101. The yield indicate high prospect for commercialization and use in cosmetic or Pharma Industry. This book, the first in the Author’s series on renewable resource, epitomizes treasures in plant residues. The insight should provoke further thought processes in individuals, Industrialists, researchers, agriculturists, investors and policy makers on value addition within the environment.